Painting of the Italian painter Pompeo Batoni “Diana and Cupid.” The size of the picture is 84 x 120 cm, canvas, oil. One of the best paintings of the mythological themes of the mature period of the artist’s work Pompeo Batoni is also known as “Artemis and Eros”. Diana, in Roman mythology the goddess of the moon, vegetation, the patroness of women in childbirth. From the 5th century BC it was identified with the Greek Artemis and Hecate. Diana was also called Trivia, the goddess of three roads, this name was interpreted as a sign of triple power: in heaven, on earth and underground. In Rome, the cult of Diana was considered non-Italian and was almost non-widespread in patrician circles, but was popular among slaves who had immunity in the temples of Diana. The temple of Diana became a favorite place for the Latins who moved to Rome, the plebeians and slaves, the anniversary of the foundation of the temple began to be considered a holiday of slaves. Therefore, Diana was considered the patroness of the lower classes, of which the colleges of her admirers were composed. In Rome, the temple of Diana stood on the Aventine hill, the goddess was considered the patroness of the Latin Union. With this temple, the legend of an unusual cow was associated, the owner of which was predicted that by sacrificing it in the temple of Diana, he would secure his city the primacy and authority over Italy. Tsar Servius Tullius cunning took possession of the cow, sacrificed it, and attached the horn to the temple. Diana was also identified with the Carthaginian heavenly goddess Celeste. Cupid, in Roman mythology, the deity of love, the personification of love passion, an unremitting companion and assistant to Aphrodite. Cupid is a god, connecting gods and people to married couples, Hesiod considers him one of the oldest gods, self-created after Chaos, Gaia and Tartarus. Sappho narrates about Cupid as the son of Uranus and Aphrodite, Simonides considers Cupid son of Ares and Aphrodite. Cupid dominates both the external nature and the moral world of people and gods, controlling their heart and will. In relation to the phenomena of nature, Cupid is the beneficent god of spring, fertilizing the earth and causing a new life for being. Cupid was a beautiful boy, with wings, in more ancient times – with a flower and lyre, later with arrows of love or a flaming torch. In the late Renaissance and Mannerism, the Cupids were portrayed as playful boys. In addition, Cupid, as the god of love and friendship, connecting boys and men, enjoyed reverence in the gymnasium, where the statues of Cupid were placed next to the sculptures of Hermes. The image of Cupid served as one of the favorite subjects for artists and poets, being an eternally living image of both a serious world-controlling force and a personal heart-felt enslaving the gods and people. 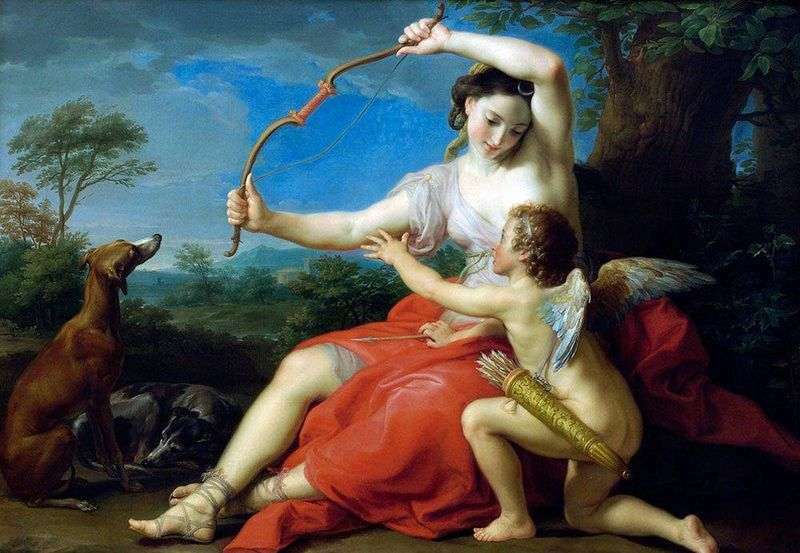 Description and meaning of the painting Diana and Cupid by Pompeo Batoni.